You know what the must-see sights are: you’ve got enough of that from your hotel, from TripAdvisor, from tourist brochures and from every single friend who has visited Prague – you’ve got those covered. But you really haven’t experienced offbeat Prague if you don’t check the following 10 experiences off your list. I managed to fit in all the touristy stuff and everything on this list in 3 days in Prague. It’s definitely super exhausting and if you can make it a 4-day trip that might make it easier! That being said, it’s totally doable in 3 days. 1. Paint the town red with a 3-hour graffiti workshop! This will remain one of my favorite offbeat travel experiences ever! Prague Alternative Tours, a small walking tour company run by Tomas and Sany, offers a 3-hour private graffiti workshop, at about USD 55 each. It’s definitely a bit pricey, but so worth it. I can assure you the experience will stay with you for the rest of your life! Our workshop was primarily run by Sany, Europe’s first female graffiti artist, and Czech Republic’s only – and guess what? She’s only 29! When else will you get the chance to say “My name is on the walls of Prague”? 😉 (I went a little further and decided to write my name in Hindi!) This is seriously one of the coolest things to do in Prague if you’re around for 3 days. Working all my arm muscles to get that damn paint out of the can! This was such a unique offbeat Prague experience, and something most visitors miss out on despite how close it is to the Prague Castle. On your way down from the Prague Castle (you usually take the tram up, and walk down), you’ll notice St. Wencelas, the oldest vineyard in Bohemia. It’s set halfway down the hill, so that you can see the Prague Castle above you, and the entire city below you. I’ve never seen such a beautifully located vineyard – it’s literally set on a slope! They’ve got great wine, and delicious hot chocolate (strange thing to try at a vineyard, I know, but it was really cold!) They also have a restaurant (Villa Richter) if you want to grab a bite. The vineyard is open all year round, from 10am to 11pm. But make sure to check if they have any special timings during public holidays or the winter season. I love souvenirs! And this cute open-air market, tucked away in an unsuspecting street, had everything and more! Magnets, mugs, paintings, keychains, clocks, notebooks, salt and pepper shakers, coasters, local chocolates and spices! They sell some very unique items, for rather cheap prices, so this should definitely top your list of offbeat things to do in Prague! Whether you’ve got 3 days in Prague or less, make sure you squeeze in a visit to this market. It’s one of my favorite souvenir markets from around the world. We weren’t planning to spend much time at Havelska. In fact, we didn’t even know about it. We were looking for the tram station to take us to the Prague Castle, when we passed by this street. We thought we’d take a quick peek, since we hadn’t done our Prague souvenir shopping yet, but ended up staying for over 2 hours! It was so worth it! There are several lookout points in Prague that people will recommend to you (Petrin Tower, Letna Park etc. ), but in my opinion, this is the best one! Since the Astronomical Clock is in the Old Town Square itself, you get a much closer view of the red roofs, toy-like streets and Disney-esque buildings than any other lookout point can offer. On your way out, there’s a little Astronomical Clock souvenir store. They had gorgeous, antique pocket watches, carved to look just like the Astronomical Clock. These watches aren’t battery-operated: you have to manually turn the dial – very old school! Pro tip: You can wear this as a neckpiece and really make a statement! What a beautiful area, with such a sad history. We took a free walking tour (one of my favorite things to do in any city), that covered some brief history of this area. But we didn’t feel like we had seen or experienced enough so we came back to explore some of the synagogues and apartment buildings. Check out the Pinkas synagogue, the Spanish synagogue (photo below) and the cemetery. There’s also a small souvenir market outside the cemetery that’s worth a stroll through. This is definitely an offbeat experience in Prague that several tourists skip out on! When WWII destroyed the Jewish quarter, land prices dropped, leading some rich guys to buy up the entire space and build beautiful apartment buildings. Some of the best looking and most expensive buildings in Prague today are in the Jewish quarter. The cemetery is significantly elevated from the ground, because in the past, when the cemetery needed more land, the Czech authorities would refuse and offer more soil instead. The cemetery had no choice but to build over existing ground, adding layers each time – today it is 12 layers high! The Pinkas synagogue hosts an exhibit of drawings by kids trapped in the Terezin concentration camp, who used art therapy to cope with their situation. Which country consumes the most alcohol per capita in the world? Nope, it’s not Germany. Much to our surprise, we learned that it was the Czech Republic! Czech Republic consumes 150L of alcohol per capita per year, followed by Austria and Germany at 100L each. So you can’t possibly come to Prague and not visit a beergarden. Most tourist websites suggest you go to Riegrovy Sady, but we heard the one at Letna Park has much more of a local feel, with a better view of the city, so we gave it a shot! The views were stunning. If you’ve got 3 days in Prague, and you’re looking for something slightly offbeat, definitely spend an afternoon here. It’s definitely something that will be on your touristy list too, but try avoiding it during the day. You can combine this with the Prague Castle and St. Wencelas Vineyard. Walking down the hill from the vineyard will eventually put you in the center of the Lesser Town (Mala Strana): a quaint area, with cute cafés and bookstores. Walking across the Charles Bridge at night is an experience for all your senses. There’s crowds of people trying to get a selfie in, musicians playing some English tunes for the tourists, artists selling their work, and boats cruising along the Vltava River, all against the backdrop of the Prague Castle lighting up as the sun sets. Maybe not the secluded offbeat experience you had in mind, but one of the things you must do in Prague! This is definitely a tour for history buffs. But our guide, Martin, did a good job of telling it like a story rather than just making it a dump of facts. We learned a lot about how the Czech Republic (Czechoslovakia back then) fits into the bigger puzzle of world history. Trivia: Czechoslovakia was under communist rule from the end of the Second World War, until the Velvet Revolution in November 1989. It was called “velvet” because of the smooth and quiet nature of the takeover! In 1993, the Velvet Divorce took place, and Czechoslovakia was (peacefully) split into the Czech Republic and Slovakia. One of the highlights of the tour was the visit to the nuclear bunker, used during the Cold War. This is now government-owned property, and you can’t visit it by yourself. The bunker is located deep below the ground, and is filled with gas masks, uniforms, and ammunition from the time! Definitely one of the coolest offbeat experiences in Prague. The entrance to the bunker! In addition to graffiti workshops, Prague Alternative Tours also runs a 3-hour walking tour that explores the alternative art culture in the city. We decided to check that out too, because we wanted to get a flavor of the local youth culture, and experience Prague’s offbeat side. In my opinion, this tour wasn’t worth the price – there were some interesting anecdotes that our guide shared, but overall, we weren’t so impressed. He did take us to The Paper Hub, a co-working space and café, made entirely out of cardboard! What’s more – it’s the world’s first bitcoin café. Grab some coffee here just to see how the whole bitcoin transaction works! Everything is made from cardboard – how fantastic! Our alternative walking tour ended at this bar, which is also where our graffiti workshop began. Cross Club is a really funky outdoor bar, made entirely out of bicycle parts. There’s a nightclub underground, that’s also made out of bike parts and has a super techno vibe! Trying out offbeat things in a city really helps you experience local culture in a way that checking off the top 10 monuments doesn’t. We had much better stories to share, thanks to these amazing experiences! 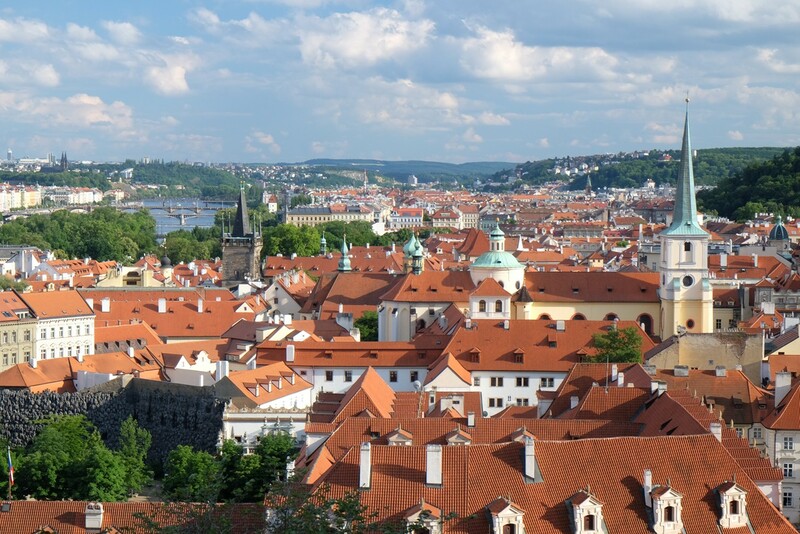 What are some of your favorite offbeat experiences in Prague? Visiting Prague? Check out my guide to finding vegetarian food in Prague. Good to see that vineyard is still there. I went in 2009, and loved the views and the wine made a nice change to all the beer (as much as I loved the Czech beer)! I hope it always remains there – despite being right outside the Prague Castle, I love that it’s still relatively undiscovered! The views are simply stunning! !